The Halloween Children left me going “What happened that night” after I read it. I am not one to spook when reading horror books unless they are about zombies and then forget it, but this one had me jumping at the house settling, BK snoring and my cats being kitty brats. 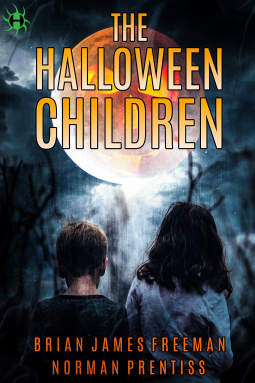 The book is told from Harris and Lynn’s point of view with some chapters being told from the investigator’s and honestly, that is what made the creepiness factor go way up. I was genuinely creeped out from the first chapter when the investigator was speaking to Harris about what exactly happened that night. There is plenty of foreshadowing but it isn’t until the very last chapters when it is revealed who did what. Now, I know that the kids were involved but I really wasn’t expecting….well you need to read the book. I really can’t get into the story, as much as I want to, because if I do I will unintentionally give away some of the plots. Let’s just say that everything that you read up until the end of the book is not what you think. Because I was very surprised when certain facts were revealed. And honestly, it made the creepiness factor of the book go up. Now I know that this is a short review but like I said in the previous paragraph, I can’t really write about what happened. You really need to go read the book!! Why: Creepy book that kept me up at night. There is a twist in the plot that I didn’t see coming at the end and it made the book even creepier.